Very interesting! The frame on the right side of the engine compartment is also where the charging receptacle wiring on my car were also found to be chafed in addition to the unspecified wiring harness chafing that disabled the A/C. After I got the car back, I secured the charging wire harness better by tying it to the stiff A/C refrigerant lines that go through this area so it is not rubbing on the car frame. I think is it time to issue out own "service bulletin" and recommends every ED owner check all wires that are routed along the right side of the engine compartment for wear. 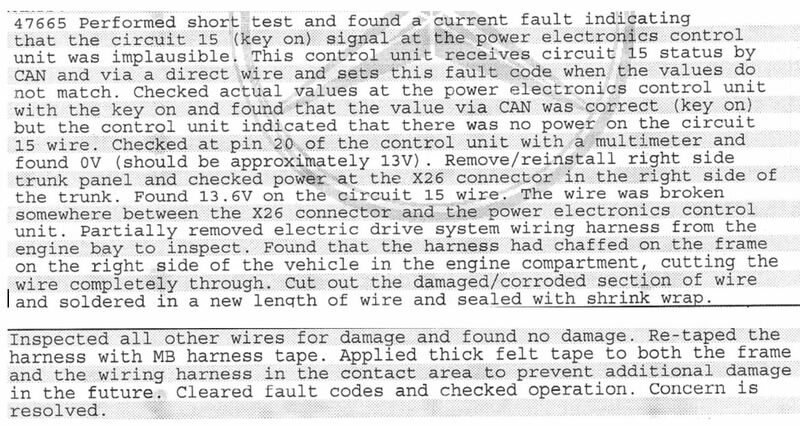 The service guy (or gal) wrote quite a detailed report. I wonder if all MB service tech's do that. I'll see if there is comparable documentation for my car. Last edited by Yinzer; 11-20-2018 at 12:44 PM. No, braking without the assist wasnÂ’t easy. I waited until late at night to drive the vehicle to the dealer so I could minimize the chance of an accident by driving when there was no traffic. Prev to my cars full shutdown, I had a crash sensor and brake system code in the system, but no affect on car or performance. I needed. IÂ’ll poke into the engine compartment this weekend and report back. With ED representing such a small production run the few reports of chafing on SCoA is alarming! Has anyone filed with the NTSB or the likes to raise the awareness and perhaps trigger a TSB or Recall? This link will get you started . . .
OliverB and Yinzer like this. Another question... what do you think the tech who wrote the report is calling the "right side trunk panel" By "trunk" I assume he is referring to the space behind the seats and by "panel" is he referring to the interior right trim, or the outer body right quarter panel? I recall they told me that they had to remove the quarter panel to replace the charging recptacle/harness unit, and also, possibly, repair the harness to the power control unit. So, to fully inspect this part of the wiring harness, some body disassembly may be needed. I had some time today so I poked around in the engine compartment and underneath as well. I didn't see anything really worrying in my ED that has done 12.5k miles in 17 months since I purchased it with 10 miles on the odometer. What I did see was a cable on the right (passenger) side that was pressed against a tube and wearing the insulation a bit. I put on some split loom tubing to protect it. Here are before and after photos. This is from the rear of the smart looking forward. This area is on the right, pasenger side of the motor bay. From underneath, to the right side of the motor, are wire bundles that are exposed. They don't chafe on anything, but could potentially be damaged by snagging something while being driven. I didn't really have a better alternative than to just put some split loom tubing on it - that won't protect it if I really catch something heavy but it should keep the wires in better shape from gravel and rocks. Sorry for the changing perspective on these last two pictures - it was hard to take a cell phone pic with the limited room I had underneath. The exposed wires are at the far right in the "before" picture, and are centered in the "after" picture after I put the split loom tubing on. jwight and Foolios like this.